Search for a pediatric dentist who is kid-friendly and experienced. The techniques and services that are appropriate for children aren’t the same as they are for adults. The dentist and the rest of the dental team should be knowledgeable and experienced regarding these differences. Beyond the dentist’s clinical expertise, a true love of children is essential. Don’t just search for a great dentist, search for a great dentist who loves children. Look for treatment areas that are age-appropriate. You and your child will be most comfortable if you are welcomed by treatment rooms that are clean, colorful, and interesting. Visual teaching tools, models, and posters can help to take the mystery out of your child’s dental experience. Modern pediatric dental offices may also feature technology such as computers, TV’s, video games, and headphones. Other comfort services such as laughing gas (nitrous oxide) and cozy blankets should be on hand for a more relaxing experience. Ask about behavioral engagement and management techniques. The dental office can be an intimidating place for children of all ages, even when it’s filled with smiling faces and cool gadgets. The dental team should encourage cooperation with positive reinforcement skills. This includes speaking to children at eye-level, using clear language, showing and explaining procedures and equipment, and patiently answering questions. 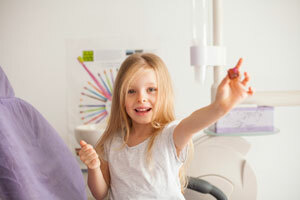 An excellent pediatric dental team may also use distraction techniques and a rewards system to promote positive behaviors. Stop by for a visit. Introduce your child to the dental team. Ask for a tour of the office. Get a feel for your surroundings. Trust your instincts. The right dental office should feel like the perfect fit– for you and for your child. To begin, contact a Charlotte pediatric dentist and reserve your child’s appointment today.